A bamboo toothbrush, with medium soft bristles. BPA free, Fair traded and vegan friendly. A bamboo toothbrush, with medium soft bristles. BPA free and Fair traded and vegan friendly. I switched to these brushes from a regular electric toothbrush 5 months ago and I'm delighted with them. I bought 5 but they last so well that I only had to get a fresh one out of the cupboard last week. I was concerned that they wouldn't clean as well as an electric toothbrush but I had my 6 monthly dental check up yesterday and the dentist said my brushing was "exemplary", which he's never said before and didn't know I'd switched brushes so these perform just as well, if not better, than electric toothbrushes. My only piece of advice is to wet the handle under a tap before brushing, otherwise it drags on the corners of your mouth and makes them sore - this maybe just me though as I've not seen any other reviews mentioning this. 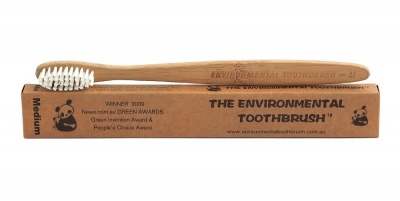 I ordered two of these toothbrushes and both myself and my partner really like them. They look so much better than your usual plastic brushes and they do the job really well, if not better. The brush feels much nicer in your mouth too. We just used a sharpie pen to customise our brushes so they don't get mixed up...he had great fun with this! I love the fact that once its reached the end of its life I can stick it in my compost bin. It doesn't get much better than that! I will be sticking with these for sure, I won't go back to horrible plastic!